Defending champions held to 1-1 draw against 10-man Ethiopia in eventful opening Group C game at Africa Cup of Nations. 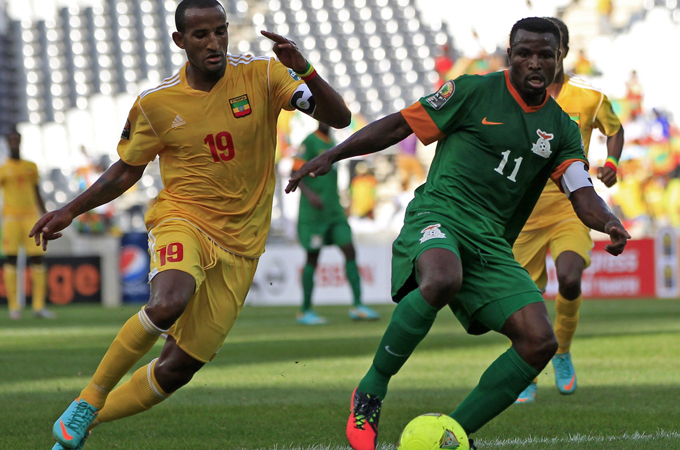 Ethiopia, back at the Africa Cup of Nations after a three-decade absence, overcame a red card to hold champions Zambia to a 1-1 draw in an explosive Group C encounter on Monday in Nelspruit. Ethiopia, one of the founding fathers of African football who had fallen on hard times before enjoying a recent revival, had keeper Jemal Tassew sent off in the first half of a game that also featured a missed penalty and disgruntled vuvuzela-throwing fans. "Our fans expected more than we did today, and they are right. Today, it was the fault of the coach. I did not prepare the team well to start the competition - we'll see how things go after the third game. " The 40,000-seat Mbombela Stadium was only a quarter full, with barely a Zambian fan in the sparse albeit colourful crowd, but one that did turn up, a man, was in a bikini. The Ethiopian keeper came off worse in the reckless assault, lying stricken on the ground for an age before being stretchered off, with Gabonese referee Castane Otogo waving him goodbye, a red card in his hand. But Ethiopia had other plans. On 65 minutes, Addis Hintsa, seconds after coming on for Getaneh Kebede, picked out Said who, in turn, found Adane Girma with the captain slotting an angled close-range shot past Mweene.